I stopped doing a Tuesday how too when I needed shoulder surgery and then had on going post op complications. Well today is Tuesday and I have been spending my days off making little Christmas house decorations for my family. My Mum made them for me many many years ago and now I wanted to make them for my children, their partners and my grand daughter. So I took some photos as I made a batch today to share the how too with you all. Cardboard. Don't use mat board as its to hard to cut allot at once. I used the cardboard behind a writing pad. Match box. Either use a real match box or some blank ones from the dollar store that are a match box with no matches in them. Mine is 5cm long, 3.5cm wide and 1.5cm deep. YOU WILL need to adjust your measurements if yours are different to this!!! Measure and mark out a rectangle that is 8.5cms by 6.5cms and a smaller one that is 7cms by 5cms. Adjust this smaller size as needed if your match boxes are a different size to mine. This smaller rectangle will be the two end parts. The larger rectangle will be the roof. Cut out both using the ruler and craft knife. Place both rectangles in the landscape position. On the larger rectangle mark the half way point at 4.25cms along the top and bottom of the 8.5cm edge. Rule a line across. Use the rear of the craft knife and the ruler to score along this line. Turn the rectangle to portrait position. On the centre line mark a dot half way along at 3.25cms. Punch a hole at this dot. Use ruler and pencil and draw a line down from the top 1.75cm marks to the 1.8cm marks on either side. Use craft knife and ruler to cut out the shapes. You now have two ends and a roof! 1) You can leave the roof unpaited but I found it made the felt covering in the next step look whiter. I just used some white gesso. 2) If you are making more then one house just use the roof and the ends you cut out as your templates for more so you don't have to keep measuring each time. Gel medium (or clear drying glue of choice). Ribbon or stretchy string to hang the decorated house with. Mine is about 25cm long. Work on a sheet of baking parchment. 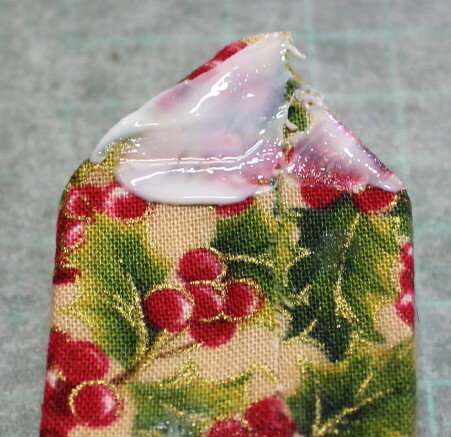 Use the cut out ends and the match box as templates and cut out enough Christmas material or paper to cover each. Use the roof as a template and cut out enough white felt to cover one side with a 1cm over hang. At one end use your finger to push in both sides of the material toward the middle of the match box end as shown. Place more gel medium on top of this part as shown. Press glued side down onto the material or paper. Trim closer to the end shape leaving a 1/2cm over hang with scissors and tapper the bottom corners as shown. Press the two end parts on and the wrap an elastic band around the base to hold the ends on while it dries.Put it aside on the baking sheet. Apply gel medium to the roof piece. If you painted it white apply it on the white side. Press it glue side down on your felt. Apply a generous amount of gel medium to the over hanging felt. Press it over and onto the rear of the roof. Its easier to do a corner at a time then then do the sides. As you stick it down at the corner apply a small peg to hold it in place, repeat to other corners then all sides as per photo below. Fold your ribbon or stretchy string in half and decide what length you want it to hang from the roof. Tie a double knot and trim away excess. Punch hole thru the hole in the roof so felt will now have a hole too. Push ribbon or string thru hole from the back. Gently use awl to push it thru if you need. After ten minutes I usually quickly remove all the pegs and place some baking parchment over the rear and then reattach the pegs again as it stops the pegs being glued to the roof on drying. I wait the ten minutes as its enough for the felt to stay stuck down when you remove and reattach the pegs. Leave this to dry for a few hours. Apply gel medium along all upper edges as per photo below. Lie roof on side and eye ball where to place the base so roof will be evenly overhanging. Gently push base into place and then turn the whole thing upright pressing the other side of the roof in place. Adjust as needed while glue still wet. Hold the roof om with one hand and use the other hand to put elastic band around each end to hold it all tight while it dries. Use some baking paper to protect the fabric at bottom and spray the roof with glitter spray following the directions on the bottle. Spray one side then the other. Here are all my houses at various staged of completion. 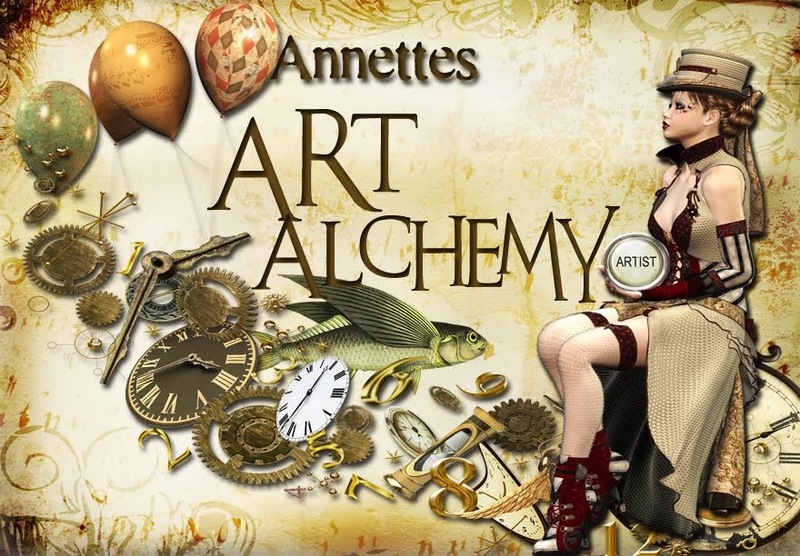 Great to see you back, Annette. The houses look adorable!